Members of the Tuesday Senior group listen intently to the discussion at a recent meeting. While the three ladies use the familiar over-the-ear headphones, John is wearing a single earphone. 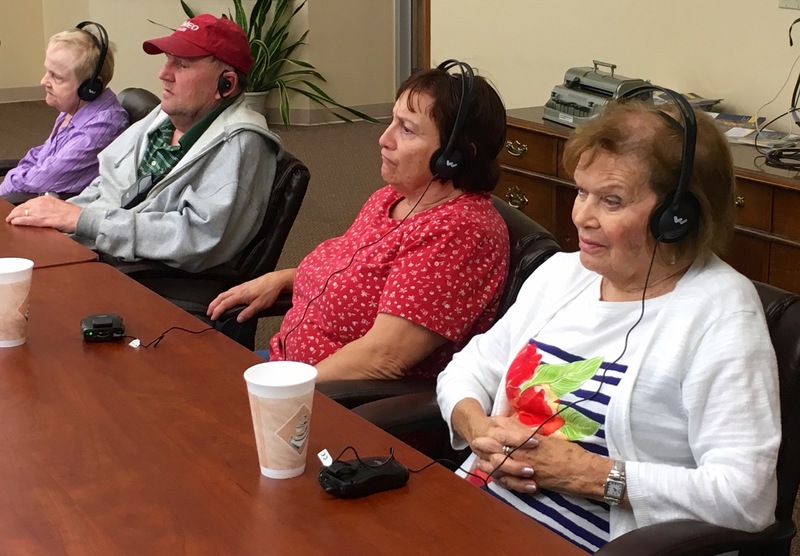 Coincidentally, both our Tuesday and Friday Senior groups have been enjoying the benefits of really hearing and listening to one another during their respective meetings. They even had a discussion about Wayne’s question themselves, adding their unique perspective. It’s all thanks to our new Tour Guide Assistive Listening System from Williams Sound. Known as Assistive Listening Devices (ALDs) or FM systems, a microphone connected to a small FM transmitter sends a low-level radio signal to one or more FM receivers with headphones plugged into them. Each receiver has its own volume control, so the user can amplify the sound to the level that works best for him or her. The custom system we put together with local Wiliams Sound rep Laura Hanson has a highly sensitive table microphone that we place in the middle of the table. It can pick up a speaker’s voice from all around the room and thus increase the sound to the receivers. In our case we have up to ten receivers tuned into the same channel. We have two types of headphones/earphones that fit over the ears. That way, the person with the receiver can use it without or with hearing aids if they have them. We e even have two induction loops that fit around the neck and transmit sound to hearing aids equipped with a Telephone Coil. “It’s wonderful!” has been a common report from our Seniors. Like a number of causes of blindness in Seniors, discrete hearing loss is also a part of aging, and blind Seniors are just like anybody else when it comes to age-related hearing loss. So are their spouses, for that matter. Each meeting we have passed out 8 or 9 receivers to members of our groups. ALDs are a standard part of accessibility for people with hearing loss in many public settings. They also can be critical for accessibility in employment. We use the same system for a staff member during our staff meetings, and one of our ITP students uses a transmitter with a lapel microphone and receiver for all of his classes an announcements. “Our Seniors are even more rambunctious now that we are using the ALD,” observes Director of Senior Services Duncan Larsen. Increased participation – now that’s the real return for investing in accessibility!